Fore Abinusawa continued her already terrific freshman campaign with a great start to her outdoor season. The Germantown Academy ninth grader put down a pair of PA#1 (albeit wind-aided) times at the Pennsylvania Track Classic at Plymouth-Whitemarsh. On a rare nice day in March where temperatures hit the high 60s, the sprinters took advantage. Abinusawa put down a 24.92 (2.2) in the 200 meters. After a long day, she didn't contest the final later in the meet. After a quick prelim in the 100 meters, the stage was set for a showdown between Abinusawa and Saucon Valley junior Talitha Diggs, a 400 meter specialist (and reigning indoor state champ) going down in distance. After a little stumble out of the blocks, Abinusawa turned on the jets to run down Diggs and take the win at the line. Abinusawa ran 11.66 to Diggs' 11.72. Although, they were wind-aided, those are two of the fastest March 100 meter times in state history. "Even though it wasn't a good start, 11.66 is pretty close to my PR, which is 11.59, and running that with a bad start means I can do so much more with a good start," Abinusawa said. This indoor season, the freshman made plenty of noise, running times of 7.32 in the 60 meters (PA No. 2 all-time) and 24.35 in the 200 meters. As an eighth grader, she ran 11.59 at the AAU Junior Olympic Games. 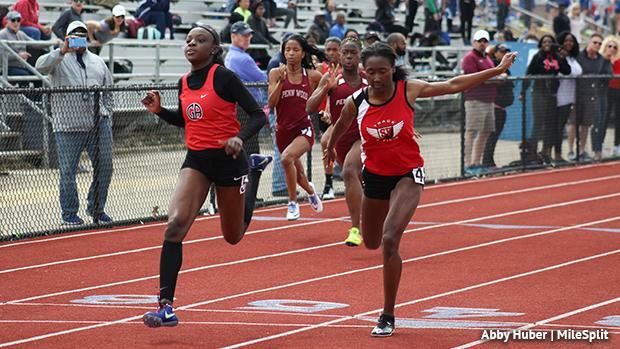 Overall, Abinusawa was pleased with her outdoor invitational debut at the high school level.